Buysoundtrax.com presents DAYS OF THUNDER: THE FILM MUSIC OF HANS ZIMMER Volume One (1984-1994), a brand new compilation of music from celebrated composer Hans Zimmer. 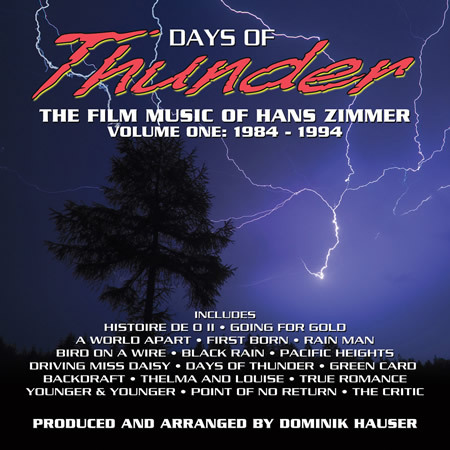 Faithfully produced and arranged by Dominik Hauser, DAYS OF THUNDER features several rare early works by ZImmer, including THE STORY OF "O" 2 (Histoire de O 2), A WORLD APART, GOING FOR GOLD, RAIN MAN, BIRD ON A WIRE, DRIVING MISS DAISY, BACKDRAFT, THELMA AND LOUISE and More. Originally from Switzerland, Dominik Hauser received his education at the Jazz School St. Gallen in Switzerland, earning a masters degree in music. In 1996 Hauser relocated to Los Angeles, to attend UCLA where he delved deeply into film scoring. Subsequently he took his skills to the realm of indie cinema and began composing for film. Hauser’s work involves him in a variety of projects, including cinema, theater and video games. Recently Hauser completed arranging and orchestration on the restoration of the first Best Picture Academy Award® winner Wings for the 2012 Paramount Picture centennial celebration. His work for the record label BSX includes The Bounty, Scrooge, Dr. Jekyll and Mr. Hyde. Hauser recently published his fourth book, Soloing for Bass. DAYS OF THUNDER: THE FILM MUSIC OF HANS ZIMMER Volume One includes liner notes written by Jeff Bond providing insight into the evolution of the album. 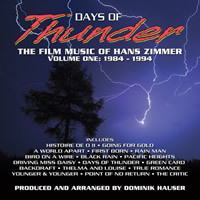 DAYS OF THUNDER: THE FILM MUSIC OF HANS ZIMMER Volume One is a limited edition release of 1500 units.